Alex J. Cavanaugh: Avengers: Age of Ulton, X-Men: Apocalypse, Stargate Extinction, True Detective, Ninja News, A to A Challenge, And Epic 2000 Giveaway Winners! Avengers: Age of Ulton, X-Men: Apocalypse, Stargate Extinction, True Detective, Ninja News, A to A Challenge, And Epic 2000 Giveaway Winners! I have an interview today at the blog of the talented Medeia Sharif. An author with multiple books coming out this year, she’s also a generous, genuine spirit. Please stop by her site! The A to Z Theme Reveal is Friday, March 21. Since I do not post on Fridays, I will reveal my theme on Monday, March 24. From Blastr - Avengers Easter egg in Captain America 2 revealed. At the end of The Avengers, Stark Tower was decimated and only a A remained of the name. 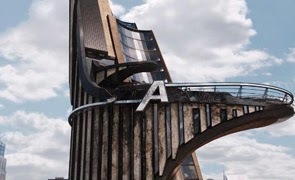 That was a hint, as fans will get a brief look at the new tower – now the Avengers Tower. We’ll see more of it next year in The Avengers: Age of Ultron. 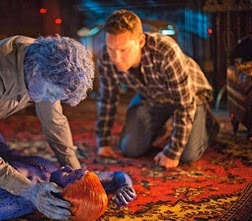 From JoBlo - Bryan Singer is already talking about the next film, X-Men: Apocalypse. Total Film also posted eight images from the next movie. From Gateworld - aborted Stargate: Atlantis movie may become comic instead. The unfilmed movie could be released as a four-issue comic through BOOM! Studios. In it, Atlantis becomes the new base for Stargate Command and faces complete destruction. The script for Extinction has been in development hell after MGM backed out due to financial difficulties. This is not the first time the series has appeared as a comic. HBO hit a homerun with this series. It’s dark, menacing at times, disturbing, and utterly brilliant. McConaughey and Harrelson do a spectacular job in their roles. Big props to McConaughey – he’s improved with every role. He owns this one. The arc of both characters is refreshing and surprising. I won’t give anything away, but the season ended on a great note for me. This Wednesday, March 19 – Susan Kaye Quinn will be at the Insecure Writer’s Support Group site, so be sure to stop by. Sean McLachlan just released The Scavenger, a short story set in the same universe as Radio Hope. Buy it now for .99 cents on Amazon. Marcy Hatch’s first book is out – West of Paradise!! Set in the Old West, this high-spirited tale of mistaken identity, romance, and murder is part historical fiction, part time travel fantasy, and completely captivating. Authors - Michael Di Gesu is looking for YOU! He had eye surgery recently and since everything appears to be fine now (we’re saying he’s healed) Michael is ready to dive into the Challenge and feature a new book each day. See his site for details. I believe it was Susan Gourley who asked that the next picture of Mini-Alex be an indication of spring. This is for you, Susan – our trees are starting to bloom! We are now just two weeks away from the start of the fifth A to Z Challenge. I’ve been blessed to participate in every single one and can’t imagine an April without it. If you’re still on the fence, let me offer this – it’s the most amazing online event you will ever experience. It will stretch you as a blogger. You’ll make so many new friends. You’ll learn so many fascinating things as you visit other blogs. And you will experience an incredible sense of belonging. We also have badges to match each day of the Challenge. Pick those up HERE. This Friday is the Challenge Theme Reveal! Hosted by Damyanti’s team, it’s your chance to reveal your theme for the Challenge. Visit team member Jemima Pett to sign up. Since I do not post on Fridays, I will be revealing my theme Monday, March 24. Wait until you see what I have planned!! Time to announce the winners! There were almost 10,700 entries when everything was tallied. (Whoa!) Thanks again to my followers and everyone who spread the word. She is getting a signed copy of CassaStorm and $10.00 iTunes card, plus a copy of CassaStorm donated to her local library. She’s getting a signed copy of all three books, a $10.00 iTunes card, and a t-shirt designed by Jeremy Hawkins. (And upon visiting the Neat-O-Shop, she selected the Ninja Army t-shirt. Awesome!!) In addition, all three books were donated in her name to LG’s local library. Congratulations, ladies! And thank you. 2000 followers through GFC is something I never thought I’d see. It’s also just the tip of the iceberg, as 3500 follow me on Google+. Plus there’s those who follow via RSS feed, Bloglovin’. Feedly, Linky Followers… No idea how many total. But I appreciate each and every one of you! Excited about the upcoming movies? (A little bummed we won’t get one for Stargate: Atlantis?) Excited about the new books? Ready to join the Challenge or reveal your theme? Be sure to visit Medeia Sharif! And due to a huge project at work and some other things going on in life, I will be sparse the next few weeks until the Challenge begins. I'm up to the letter O with my A-Z blog schedule already. Last year's was fun. A huge congrats with your 2000+ followers on GFC. That's truly amazing and worth the celebration. I've heard others talk about True Detective. Must be good. And are you are you sure, Little Alex, that things are blooming. It feels like spring will NEVER get here. Good luck with the project at work and things at home. I've heard a lot about True Detective in the last few days. Has it hit Netflix/Amazon Prime yet, I wonder? I'll have to check. I am ready for the Challenge and excited about my theme to be revealed on Friday. Congratulations on 2,000+ followers, and to the winners. Alex your posts are always so timely for me. Saturday night I began watching True Detective on HBO GO and I am absolutely hooked! I am 4 episodes in, with 4 to go. It might be one of the top 3 shows I've ever seen. I didn't know there was an AtoZ theme reveal day! My theme reveal post is scheduled for next Wed. already. It'll be a little late to the party! Congrats on reaching 2000th follower!! Congrats to everyone with news, and special congratulations to Alex for reaching 2,000 followers! Congrats on reaching 2000 followers. It's a milestone. Glad you liked True Detective. We've only watched two. Have some catching up to do. True Detective is a real class act! Lynda, it still blows my mind. Brinda, my allergies tell me things are blooming. Elizabeth, it's not on NetFlix. HBO doesn't play well with NetFlix. Keith, it's awesome, isn't it? Laura, so will mine, and that's all right. Love Medeia. Heading there next. Seriously? More carnage in X-Men movies? I haven't followed the comics, so I have no idea what they're like. I may stop watching the films then. It's so nice to see blooming trees. We're still buried under snow here. I have got to start watching True Detective - I have heard so many great things about it! Don't have HBO though…. Can't wait to see what your A-Z theme is! I'm still working on mine…. Spring? It won't even hit 40 degrees here today. I've heard such great things about True Detective. I wish I had pay for TV to watch it over here cos two of my fave actors are in it!! How swoon worthy is that!?! Yay for your interview over at the lovely Medeia's! Yes you totally rock!! And hoorah for Marcy and Sean and mini Alex!! Congrats to everyone with books coming out and good luck on your huge work project. Good to know about True Detective. It was an odd pairing with McConaughey and Harrelson. I hope I get to check out True Detective if/when it hits Netflix. I've heard good things. I loved True Detective SO much! Honestly sad its over but I loved the ending. Heading over to read your interview now. Go Marcy! Wonderful news for her! I want to see True Dectective so bad. I hear it's awesome! You've certainly become something of a cult Alex. Congratulations on all the followers. Pleased to report I have finished all my A to Z blogs. Seemed like more work this year, not sure why. True Detective is on my list of shows to watch. I'll have to see if its on Netflix yet. And I;m still working on my A to Z blogs. Should finish real soon. Good luck with your project at work. Congrats on reaching the 2000 followers goal. Maybe April will take you to 3000! Kitty, sorry you don't get to see it. Mason, they play well off each other. Julie, the ending was awesome. Very redemptive. Jo, you have two weeks to relax then. Stephen, not on NetFlix, and won't be for a long time. Shell, that would be scary. Wow - lots of creepy goodness. Glad to hear Michael is getting better. I will check out your interview. And I started organizing my stuff for the A-Z Challenge. I'm pretty far behind, though. Congrats once again for hitting 2000! Congrats again on 2000 and congrats to the winners! True Detective was amazing, and I can't believe I'm saying this, but Matthew McConaughey earned my respect with that show. I guess I can forget all those shirtless romantic comedies he used to rack up once upon a time ago and take him seriously as an actor now. Lots of good news and fun! Thanks as always, for sharing. :) Hopping over to Medeia's now. Waiting to see if this X-men is any good before Apocalypse, hopefully it is. Yeah, wish Atlantis was a movie. But with all shows coming back in some form, Veronica Mars, 24, Heroes, only a matter of time before it comes back in some way. I'm so glad that mini Alex is endorsing spring, especially since we got another inch of snow yesterday here in MO. All the good movies out there and I saw "Need For Speed" when I went to Florida. Good morning, Alex! Long time, no see. I've missed your blog-verse updates! I'll be reading during the A-Z Challenge. I'm looking forward to the theme reveal. Have a wonderful week! No movies listed interest me. Even with "Apocalypse" in the title, "X-men" is enough to turn me off. The super hero movies just don't thrill me anymore. Good pep talk for the Challenge. I've been tweeting about it a lot and put up regular Facebook announcements. Sign-ups are picking up again. Jay, you still have two weeks. You can do it! Brandon and Bryan, I thought the same thing! He used to do those fluff, romantic roles, but now he's a really great actor. Pat, maybe they should do a Kickstarter for it? Al, I will avoid that one. Jen!! Good to hear from you. Congrats on reaching the 2000 mark. Seems a lot of the blogging world has quietened down over the last two years, so good to see some leading lights still going strong! Alex, your success in blogging is remarkable and so deserving. I am sad I won't be participating in the challenge this year. Sigh! Thanks for the Spring pic. We're expecting more snow in the next couple days. The bit of thaw in the last week, though, made us all happier! Looking forward to April, Spring, and the A to Z Challenge. I'm a huge fan of Medeia (and you), so I'm on my way! True Detective is one I'm waiting to see. I knew that about the "A" on Stark Tower. I didn't realize it was supposed to be an Easter Egg. I would love to know your topic from A to Z, I'm still looking! Lots of good info here today. Love all of the movie stuff (yay Avengers and X-Men). I was unaware of the TV show True Detectives. I think I will have to look into that. I am actually looking forward to A to Z! Woohoo! Grats to Andi-Roo and LG Keltner! For some reason, my work proxy is blocking Medeia's website, but I'll be sure to hop over once I'm home. HBO does pretty good with the few series I've seen. I just wish I had more time (and the channel subscription) to watch them. Heading to Medeia's blog! If Mini-Alex doesn't see his shadow do we get four more weeks of winter? Thanks for the heads up about A-Z theme reveal day! I am so excited to let the world know I'm taking part in this crazy challenge. A lot of great sci-fi movie news! I already have all my A to Z posts scheduled...let's do this! thought of participating in the A to Z but, not sure how I would swing that...it sounds like life is keeping you busy..enjoy the moments of life they are precious..
Have to admit the challenge stretched me as a blogger but I think I had more fun reading and commenting than writing them. Good luck with everything. I'm so excited for A to Z, and I'm also super excited to be the grand prize winner! Congratulations on 2000 followers! Ah Alex, I've missed your blog. I've been away from blogging for too long. 1) Cannot WAIT for Age of Ultron. I just wish it were THIS summer. 3) I wish the Star Gate movie would happen, but I'll take what I can get. 4) I haven't seen True Detective yet, but now that it's all finished up I can't wait to get started. 5) A to Z yaaaaaayyyyy! It's getting so so so close! Wonderful news for your winners and for you! I love that you give to the library, too! What a great way to celebrate your followers, Alex. I can't believe you have spring! I still have 'feet' of snow outside trying desperately to melt. I need COLOR!! I'll go check everything out now! I am so on the fence/ off the fence/ burning the fence about A-Z. When I am wading through my pile of laundry, I am so not in. Then I see posts about it and I am so wanting to join. I'm on assignment in Belgium all this week but once I get back I'll be gearing up for the A to Z! Thanks for the spring pic. *SIGH* No signs of spring in my area, still white with snow...I've heard great things about True Detective, though, I don't have HBO. Would love to watch it! Great Interview over at Medeia's. I hope this new X-Men movie shakes out well. It's a relief having Singer back on board, as it was his direction that got the films to thrive in the first place. I'm totally down for an Apocalypse movie and on-going character. LOL, thanks for the picture which has left me totally envious as we're having more snow here today. I really wanted a Stargate Atlantis film and am looking forward to Avengers. Hi Alex - good luck with the project and I still must write my A-Zs .. and Mini Alex and the apple blossom looks good - gosh it's lovely Spring is here now ..
Lee, we'll still see a big rush in the end. Karen, there's always next year. Loni, sorry - hope you can get through soon. Maurice, heck no! Ready for spring. Kirsten, they don't have to be, just a good recommendation as many people try to visit a lot on the list. Truedessa, you should. Pat does a great job with his poetry posts for the Challenge. SL, missed you. I really wish they'd do another Stargate movie. Heather, stick Stormy out there - he's colorful. Susan, you're welcome, and sorry you don't have spring blooms yet. Congrats to the winner of the Epic giveaway. Congrats to those with books out! Congrats on the followers and also to the winners of the giveaway. Looking forward to Divergent at the moment in our house. Love the ninja pic! I also heard that True Detective is dark....way too dark, so I'm kind of scared off for now;) Also, what's up with all the X-Men films...I used to dig them, but now I've just lost track of how many there are. I'm a little bummed too about the Stargate one. Maybe they'll one day change their mind. Congrats to Andi-Roo and LG! Love springtime Mini-Alex! We need more spring. I've heard so many good things about True Detective. I'm definitely going to check it out next. I don't know why, but mini-Alex seriously cracks me up... like, he'll never get old. I love him!!! Love all the news, Alex. Hope you are wonderful. Yay for Spring! I'm surprised there'd be stories about the "next" X-Men film when DOFP has not even hit theaters yet! I've got all my A-Z posts for both of my blogs finished, though they might need a little tweaking here and there. It took a lot longer to put together the posts for my main blog, since they involved a lot of pictures. Yay, an Alex post!! I'm so glad to know that Michael's surgery went well and that he's reading well again. Aaaaaaaand, I'm doing the A to Z challenge this year! First time ever and a bit nervous as I don't always have the most spare time...but I've always wanted to do it, so we shall see how I fare. Totally checking out your interview, as well! My goodness you pack a lot into your posts. Enough to make those of us without ninja strengths swoon. And talent, dedication AND generosity attract followers (stalkers). Of all the excitement here, I only want to say that that is the most endearing spring portrait I've seen in a long time, if ever. Hugs to you and Mini-Alex. I enjoyed True Detective up to a point. Great acting but the whole serial killer plot got wrapped up a bit easily for me. Still, worth a watch. Mark, there is a silver lining! Morgan, I'll keep posting him then! Randi Lee, glad you are joining us. Oh, thank you for that spring shot. Still feels like months away for us today...but your blossoms cheered me up! Congratulations to the giveaway winners! Glad Michael is doing well after surgery. Good luck with the A-Z challenge...it's coming up quick! Great to see a touch of spring here! Congrats to Sean and Marcy on their new books! Now I'm headed to Michael's . . . . I read "The Scavenger" by Sean McLachlan on Sunday morning. Good introduction to the series. One thing which really surprised me was that most of the story is without any dialogue! You will recognize it in the moment when finally someone talks. I keep wanting to see True Detective. Love Matt McConaghey (sp?) and I loved his speech at the Oscars. Good interview. Short but good. Tim listens to music when he writes as well. Great interview over at Medeia's place... but I don't know about the "slow typing" part...? Congrats on your epic 2000 followers and to Andi-Roo & L.G. Keltner! You always have such a variety of news and information on your blog, I never know what to comment on first. Let's just say I appreciate all of it. This is my first year for A to Z and I just finished getting all my posts written and scheduled over the past weekend. I'm ready to explore as many new blogs as possible! Alex: who's team am I on. I entered my Secondhand Shoes blog.i stay confuse. Time is running away from me. Who can ever forget that first A to Z.? Glad Michael is getting better and good luck in the challenge. I am so looking forward to the new X-Men and Avengers movies. They better live up to the hype. Lots of news today. Congratulations to LG! That's awesome. True Detective is something I really want to watch. Might have to wait until The Walking Dead is done and then watch it, though. I'm heading over to Medeia's now! First off, "sudden" would be an understatement for the way SG Atlantis ended.. everything was in trouble, and then DEUS EX MACHINA! They're all safe and sound on Earth. Can you imagine my face after binge-watching 16 total seasons of Stargate for that? Also, congrats to the winners of the 2k Followers Giveaway -- lucky sons o' monkeys! Congrats on the followers and winners! Woah, cool, the Avengers tower! Edi, he's writing as fast as he can! Sarah, his speech was great. Michelle, I really type slow. Thirty words per minute tops. Lynda, glad you are all prepared! You're going to have a great time. Shelly, what number are you? Yvonne, will never forget that first one! Bison, I didn't even know it was the series ending - I thought it was just the season ending until my wife pointed it out. I was bummed!! Heading over to check out your interview! Looking forward to it! I'm definitely bummed about Stargate: Atlantis. But I'm excited about the X-men, and Avengers movies. Plus, A to Z is coming soon! I'll be by Medeia Sharif's tomorrow - today wasn't an online day for me until 8p.m. ... sometimes it just goes like that. I enjoyed True Detective too. I hope that was the series end too. It was an excellent mini series. Ah, doesn't mini-Alex look cute with all those flowers in his - mask. I enjoy the X-Men movies so maybe I'll catch the newest one--apocalyptic films are always so much fun. And one of these days I'll get HBO (and a better TV) and watch cool series like True Detective. So good to know there are intelligent shows to watch. Congrats on reaching over 2000 GFC followers, and congrats to the lucky winners! I also liked True Detective. Great point about how MM improves with every role. There will be new stars taking over next season. Congrats to the winners and great ninja news. It's wonderful having you at my blog. I am working on getting my A-Z posts organized, it took me a while to decide on a theme. Heading over to Medeia's blog now. Donna, that ended the season for those characters. Next one will be new characters. Carolyn, glad you have one now. Wait? Work interfering with blogging? How can this be? LOL. Congrats to the winner of your give away! Although I had about a quarter of my April postings started I have changed my theme for this year. Can't wait for the theme reveal hop to read others themes for this year. Thanks for the info on Avengers and X-Men. I love those franchises! I've heard good things about True Detective. I hope it comes to my area soon. Congrats to Sean and Marcy on their books and Andi-Roo and LG on winning your giveaway! I've already revealed my A-Z theme. I'll try to remember to do it again on the 21st. Those badges for each day are a good idea. Thank you for those. I still can't decide what I feel about that tower. It's very 'out of this world'. I'll have to catch the interview. So you're going to keep us in suspense over next weekend re: your theme. You must be a novelist the way to create suspense! Have to see what Michael is up to! Tina, I know I can't type fast enough. Fanny, I like the daily badges. Lee, you have to wait! Medeia is a great person - and a really hard worker! I'll stop by and read your interview. Visit Medeia's blog - check. Pass Genre news along to my boys - check. Glad to see I can catch episodes of True Detective online. Sounds right up my alley. Mini-Alex is looking good! Getting excited for the #AtoZChallenge! Congrats on your number and to the ladies that won your fab event! Thanks so much for the shout out. Still need a few more letters, but I'm sure they'll trickle in by the end of the week! Thanks for all the prayers and positive eye support! I read THEME and immediately panicked. But really, what's to worry about. 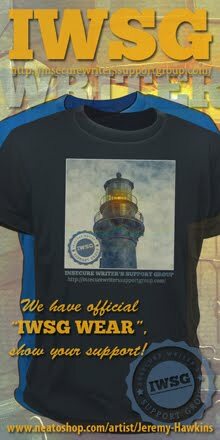 I'm A-Z encouragement for our IWSG followers. How hard can that be?! My brother had high praise for True Detective, too, and McConaughey in particular. I still mean to catch Dallas Buyer's Club. Enjoyed your interview over at Medeia's! Alex, what an amazing number of followers you have! Congratulations! Do you really have dogwood in bloom? It is desolate here in Virginia. We have a few scraggly daffodils in bloom. Usually, by now, we have lots of forsythia. Look at the great books to come! Congratulations on passing 2000 followers and congratulations to the winners! I have this mega theme for AtoZ but I haven't revealed it at all yet. I might reveal it next Wednesday, but it involves Real Life and I'm waiting till all the is Ts have been crossed and the Is have been dotted... Can't wait to share! Hi Alex, you have some amazing stuff written her. My mind is so charged up after reading it. Great to be a part of the atozchallenge and glad I joined it. PS. Your about page says your 3rd novel will be out in September 2013.....It needs updating. Thanks for being a great guy and super supportive blogger. I'm all for indications of spring! :) Congratulations on passing 2,000 followers! Congrats, Alex! You really do have an army! Michael, hope you get all the letters filled. Mary, we do! I'm far enough south I guess. Deniz, look forward to it. Congrats on 2000!!!! That's amazing! I'm glad Michael is okay. And I'm very excited for this year's A-Z! Love seeing Mini-Alex bringing Spring to us. Right now, all my family and I can think about is the Captain America movie. It looks pretty good. Thanks for the reminder about Susan Kaye Quinn's visit to ISWG tomorrow. Love the Mini-Alex. Yes, think spring. There is so much going on I don't know how you keep up with it all. Woo-hoo, can't wait to see what your theme is. I've only seen a few minutes of True Detective. I had no idea what it was, and thought it was a movie. Now I've heard a ton about it, so should have watched it. I'm actually looking forward to the next Avengers film - I blame my kids! True Detective looks really good. Now I'm going to have to go watch it. Congrats to Marcy on her first book! I love the spring shot with mini-A! Is A to Z already so close?!! Holy cow, I need to get the rest of my posts figured out. I only have about 10 done. Eeek! My theme reveal post is ready! Congrats to all the winners of the giveaway! My boys will enjoy the next Avengers film and I guess I need to check out this True Detective everyone is talking about. Congrats to Marcy on her first book--so exciting! Congrats on reaching 2,000 followers--such an accomplishment. I still don't know how you do it all. Love the pic of Mini-Alex in front of the dogwood tree. Our dogwoods aren't blooming yet--could be the ice storm we had two nights ago? Crazy weather. David, as it it will be destroyed even more? Ken, looking forward to that that film! Beverly, that's why I'm scaling back the next two weeks. Sabrina, you still have two weeks! Kristin, more than once that white has been ice as well as bloom. I'm totally stoked about the A to Z Challenge. Just finished creating my posts, and I feel like I can breathe for the first time in weeks--but not too quickly since I clearly need to get my post ready for the theme reveal. By the way, I want my cloning machine back. Andrew Leon totally called shenanigans on your ninjas stealing it. That's right. I'm on to you. Alex-- Congrats on reaching 2,000!!! That's quite an accomplishment. I'm a little disappointed about 'Stargate Atlantis' not getting a tv movie to finish things up. That was one of the better soft scifi series on television. I miss it. I don't know if I have the stomach for 'True Detective.' When I read about it, some of the stuff turned my stomach. More than 2000 followers....no WONDER you get so many comments! Crystal, I had it first! Built it over three years ago. Boo about Stargate. I'd like to see more of it. There's no decent space opera on TV anymore. I'll be AtoZing with the UR bunch this year. I love Stargate Atlantis - they could totally do a movie for me! Apawlogies for my late arrival. I'm almost as busy as you seem to be. As you might know, I have left a comment on Medeia's pawst. I'm not sure if you are having problems with GFC. For about a week now, we cannot sign in or follow new blogs. If you are experiencing this now, it might be a good thing that it only started acting up after you passed 2000. You deserve all the interaction you receive. I know that I'm grateful to you, good human. Just watched the last episode of True Detective last night, and OMG I love it. Where is seasons 2!!!!!!! Though I'm not sure how i'll go with different main characters, but it's bound to be good. Great interview over at Medeias and you have made me curious about True Detective... May have to give it a try, but I don't usually handle scary well. Creepy I could possibly do, scary... not sure :) We'll see. Haven't seen "True Detective," although I've heard a lot about it. Never saw any of the Stargate TV shows. I feel like I'm missing out. I'm with you, Alex. I loved the HBO series, True Detective. I wasn't sure what to expect and was surprised with how good it really was. I'm a big fan of Harrelson. He just keeps getting better! I wish Stargate: Atlantis was in both formats: movie and comic! Gary, sorry you are having troubles! I've been offline a bit this week and hadn't noticed. TF, season two is coming!! Nigel, really??? You need to watch them. Elsie, they are both getting better. I love Medeia's blog. Congratulations on the interview. Thanks for informing us about the A to Z theme reveal. I might participate too. I've been on the fence for the A-Z challenge, but I'm finally going to sign up. It's time to do something fun! Didn't catch True Detective since I don't have TV now. I've read about it and was surprised since some elements of the story are similar to a book I want to write in the future. Thanks Alex, for all your share and do! We appreciate you too, Alex. love the upcoming movie tidbits! i hear good things about true detective, not sure i'd like it, i'll stick with game of thrones! can't wait to hear what your theme is! teaser! 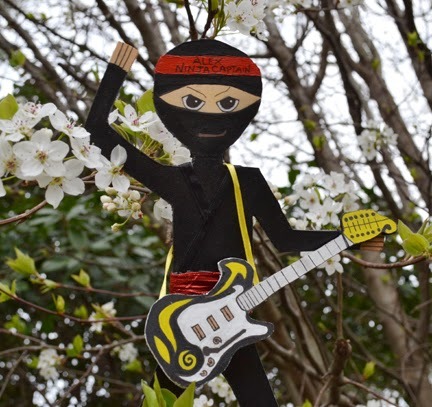 Aw, the little ninja looks cute between all those flowers. Congrats to the winners! Ug! I'd so like to do A-Z again, but I can't wait to pop in on everyone else. Congratulations to the contest winners and on the new releases. Nice to see a little springtime. I totally agree on True Detectives and on Matthew McConaughey. He's really grown as an actor. Karen, glad you can join us! Steven, you'll need to catch it sometime. No television? Really? 2003 followers, that's a huge number Alex. Congratulations to the lucky winners. Will hop over to Medeia's blog now. I'm now very intrigued by the next Avengers & X-Man movies...eeek! And now going to check out Medeia's blog! Will be back Monday to check out your reveal. Enjoy your weekend, Alex. Congrats to the winners! Great interview and Susan's advice on discoverability is so valuable. The key for me at the moment is to keep writing. Hey alex it is that time again! I can't wait to see what you have planned and I hope you will love what I am doing in my geek and disney worlds this year! WOO HOO Teresa From the following sitesFangirl Next Door Stormy's Sidekick Quackin Over Disney Geek On! Your mini Alex adventures never cease to make me smile! Well I messed up this week. Hey Alex, glad to see Mini-Alex enjoying himself out in the sunshine. So many things get canned due to 'financial issues', sometimes it's just cowardice or greed. Not everything can make a billion dollars dollars people (or half). Congrats to the winners and see you Monday. I had planned to work on my schedule today but my blog is having a hiccup so going to work on it with pen and paper then type it up when it's fixed. My foster son really wants to go to see Captain America 2 - he's desperate to go next weekend when it opens here. I did send my brother a picture of that Easter Egg to see what he thinks as he's my resident knowledge base for all things Avengers, Iron Man, Captain America etc. Hey Teresa! Good to hear from you. Glad you are one of Stormy's sidekicks. Lydia, I am here to amuse. Sheena-kay, how did you mess up? Hannah, sorry your blog is having issues. My dad was really excited about the idea of the Stargate Atlantis movie. He hasn't tried to read comis books before, but he might for this. Great reviews; everyone seems to agree True Detective is a hit. Looking forward to reading everybody's A2Z posts next month. Not a big fan of X-Men, but I heard there's going to be yet another Wolverine solo project, and I'm stoked about that. Lookin' forward to your big reveal, Ninjalex. 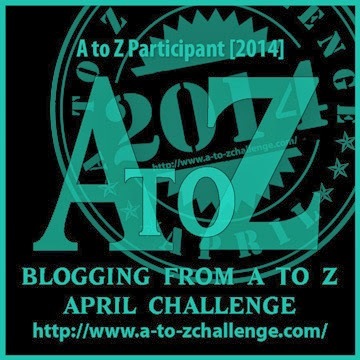 Okay....I am a bit overwhelmed, but I'm in for this year's A-to-Z blog challenge. Best I get busy! The Avengers Easter egg is pretty cool. I didn't know that. I haven't watching any of True Detective yet but I'm looking forward to catching up on it. It looks really interesting with a great cast.